Some of you have noticed the old rocks we had in the aquarium stand that Delilah and I sleep in. Well, since Tristan and Crikey sent us our cool new Boogie Mats, Mommy decided to put those rocks away (she still won't throw them out because she is sure she'll get another aquarium one day) and make a more comfortable love nest for Deli and I. So far, we've each slept in there but not together. I'm a little concerned that Delilah and I need the rocks to be romantic. 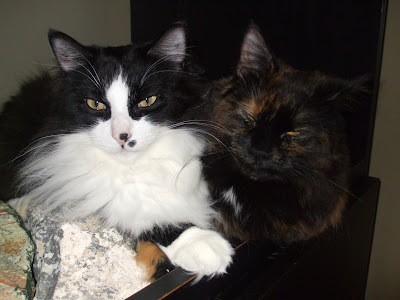 Maybe dirty, old aquarium rocks are a Tortie aphrodisiac! In fact, the more junk in there, the better! This is how we used to spend our time in there (We've posted this video before. 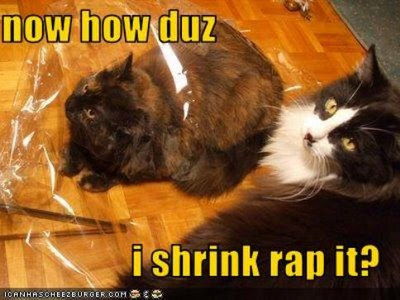 It's rated 'R' and not recommended for young kittens). I'm going to have to try to woo Delilah all over again. Wish me luck! Also, This weekend Mom is going to attempt to transfer our blog over to a domain name that she bought (www.themonkeys.ca) so we're hoping we don't disappear! If we do, just click on the site to find us. We received our Paw it Forward package from Tristan and Crikey on Tuesday night and we are so excited! The Ball Guy and Mommy's friends Tania and Scott were here so it was a little hectic. Scott and The Ball Guy were putting in the air conditioner. 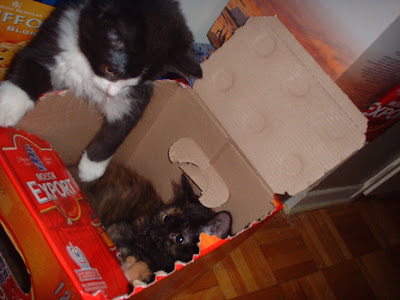 When we got the box open, we both grabbed a nip nanner each and went wild! We thought it very appropriate that we were sent bananas, being Monkeys and all. Look at all the stuff we got! AND we got a Daisy card to pray to like Crikey does! Samson didn't let Mommy take a photo of the whole package (he kept stealing the Nanner as you can see by the blurriness. He even got in the box with all the toys! I really love my new Boogie Mat! If you're interested in receiving a Paw It Forward package from us,we're going to send one to one of our friends and then you can paw your own package to one or more of your friends! Just let us know in a comment that you're interested. It really is so much fun! Thank you so much Tristan, Crikey and your Mom. We love everything! UPDATE: We're Pawing forward with Angel, Isabella and Sadie from The Beaded Tail! We think it'll be fun to put together some fun stuff for another Tortie like Isabella, the beautiful Angel and a woofie (Sadie)! I've been feeling a little under the weather again with another bout of URI so when Mommy was taking these photos for my Tortie Tuesday post, I wasn't as enthusiastic as I usually am. My appetite is as hearty as ever and I'm not dehydrated, I'm just tired and sneezy. I'm actually feeling much better as of yesterday but it has been a rough couple of days. We have a vet appointment coming up for Samson's teeth evaluation so Mommy said she's going to have the vet do some blood tests and make sure I'm okay. I did some very enthusiastic ball-chasing yesterday and I ate all of my raw food and most of Samson's. I'm feeling much better! Mommy worries too much! I had mentioned last week that Delilah and I were invited to become members of Floof and Fur. Yesterday, we posted our first post there, but the coolest thing ever was this cute little badge they have there for me! The weather here is stifling hot and although Mommy just bought a brand new air conditioner, it's not installed yet. Hopefully The Ball Guy will read this and take my not so subtle hint! We're mostly furry over here! Mommy tried to install it herself but she just started saying a lot of bad words and then got out the fan. Some independent woman! Delilah and I are back, finally! Thanks for putting up with our Mommy for a couple of days. She is a bit wordy, but hey, she loves us and that's all that counts! Ever since Mom posted pictures of my yawns a while back, and leaked that I do a long squeak when I yawn, she's been trying to capture it on video (as some of you requested). Of course, I'm not going to make it too easy for her! Here's a video of one of her attempts. I just wanted her to hurry up and feed me. She says she's going to keep trying until she gets it. 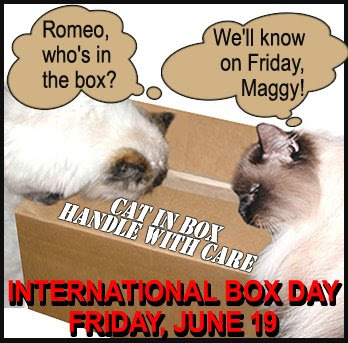 Tomorrow is International Box Day! We're very excited and as most of you know, I'm a dedicated boxaholic. We hope all of you are participating by posting your box pics! 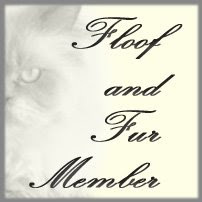 Both Delilah and I have also been invited to be members of Floof and Fur! We're very honored to be members and we're working on a post for the blog. May 17th, 2006. It was my 40th birthday and a friend and I were having dinner. We were discussing pet mortality; his beloved dog of 17 years had recently died, and he was having great difficulty adjusting to it. I was trying, gently, to encourage, if not an immediate adoption of a new pet, at least an open mind to the matter. 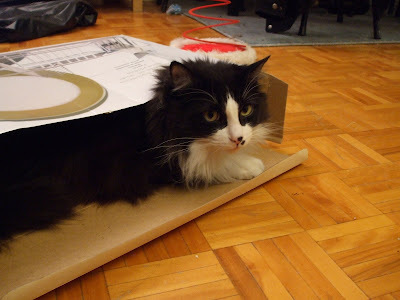 Meanwhile, my cat Muddy was ailing with well-compensated kidney failure. My friend asked what I thought I would do when Muddy was no longer with me. 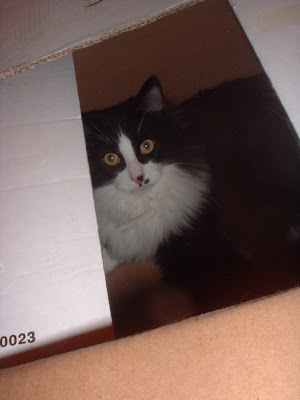 I didn't realize at the time how soon that would come to pass, being, perhaps, somewhat in denial about my pet's condition. 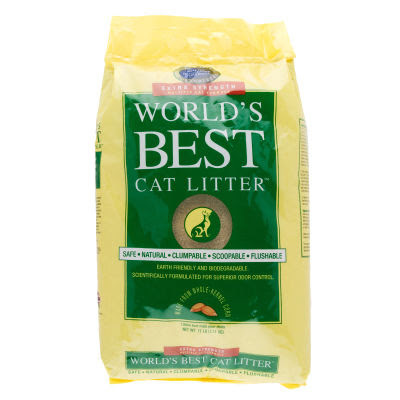 Muddy had literally found me so I responded that I would get another cat, but I would not seek him/her out; the cat would find me. This would give me a year or two to grieve and I knew that to follow in Muddy's enormous paw steps, the cat would have to be extra-special and if he/she found me, that would make it 'meant to be'. Little did I know at the time but, on or around that very day, my extra-special cat was being born. Barely three months later, on August 10th, Muddy died from a stroke. Even being somewhat prepared for his death, it was devastating. I was inconsolable. Six excruciating days later I received a call from my friend's daughter, Chelse. She was whispering because she was calling behind her mother's back. 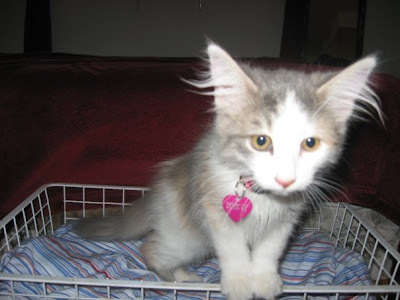 It seems Chelse had found a kitten in the alley behind her house and, because they already had two cats, her mother insisted they bring the kitten to the shelter. 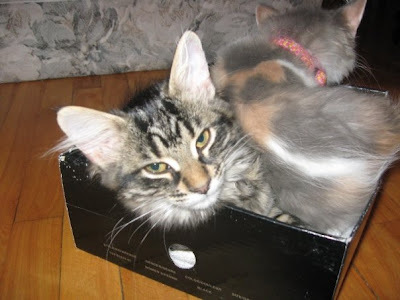 She thought of me immediately and when she asked her mother if she could ask me to take the kitten, her mother insisted that it was far too soon after losing Muddy and she was NOT to call me. Chelse, who is normally a very obedient girl, snuck into her mother's room, looked in her phone book and called me. I was not even close to being ready for a new kitten but I remembered the vow I had made and I knew that I couldn't mess with destiny. I asked Chelse if she could bring the kitten to me and she and her sister came right over with Delilah. Her pretty little 'no BS' face fascinated me. She was hungry for food and I was hungry for some sort of distraction from my grief. She was the exact opposite of Muddy in that she was young, female and full of energy, so I didn't feel guilty about replacing him. Every day that she was here, I felt a little bit better and started laughing about how she was not afraid of anything. I realized just how devoted to me and fearless she was when a frozen tube-shaped package of beef fell out of the freezer as I opened the door and it crushed my toe. 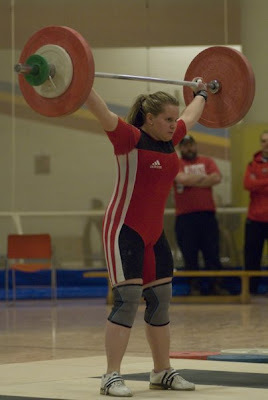 The pain was so intense that I yelled out and cried and hobbled to sit down. She sat, for a moment, staring at me trying to figure out what to do, then ran off to the kitchen. When I managed to return to the kitchen, I found her attacking the meat tube, shredding it with her back paws. The next time I went to open the freezer, she looked at me as if to say, 'Are you sure you want to do this?' and got in an attack stance so she'd be ready for any flying meat! She seemed to instinctively know when I was feeling bad and when I cried about Muddy, she'd curl up in a little ball on my shoulder and dab my neck with her wet nose as if to say 'I'm here'. Delilah was exactly what I needed and she still is really in tune with my moods. She's not as constantly demonstrative as Samson is, but when I need her, she always seems to be right there, ready to cheer me up. I had never thought of getting a Tortie before I met Delilah. In fact, I wasn't really fond of the look of them (gasp!). But Delilah changed all that for me and I found myself looking for information and pictures of them and developed a real fascination with them. 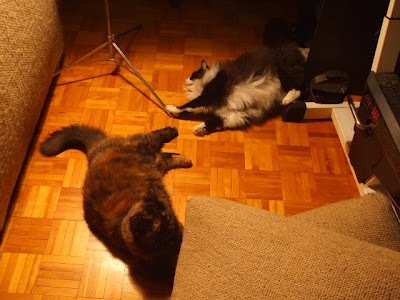 Of course, after we started blogging, I found even more wonderful Torties (Tasha and Isabella primarily) to read about and now I'm hooked! I'd like to thank Samson and Delilah for letting me write about them. I hope they let me blog again but I imagine they're so mortified with what Mom wrote, that they won't be taking any time off again in the near future. The Monkeys have graciously let me take over their blog space to write about each one of them. I know they're worried about being embarrassed in front of their friends so I'll try to keep the 'mush' to a minimum. I'm starting with Samson which is a little bit out of order because Delilah found me before him, but I'd like to keep it in the Mancat Monday and Tortie Tuesday order. July 27th, 2006. 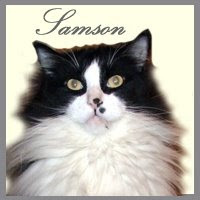 Samson was born with his two brothers and one sister and for reasons I'll never know, their mama never came back to nurse them. 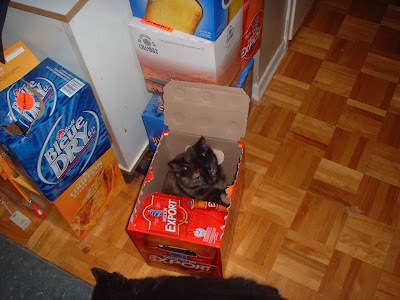 Shortly after his birth, a woman named Stacie found the kittens and started bottle-feeding them. 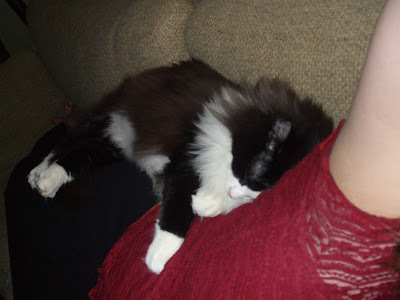 He was the biggest kitten in the litter and apparently loved Stacie very much. I think a big part of his personality today is that he never had a cat mommy so he didn't have the proper cat training and weening that they all get and he thinks of human females as his mothers. Flash forward to September, 2006. I was looking for a playmate for Delilah who had decided that I was her prey or plaything... I'm not really sure what she thought but she was hunting and stalking me in between all the snuggling we were doing. I was planning to go to the shelter, but a friend who knew I was looking sent me this picture of Samson. Of course, after seeing this photo, I couldn't turn back. He was one of the cutest things I had ever seen and I knew I had to have him in my life. Delilah was 4 months old when I brought Samson home at 2 months old and he was 'the big boss' in his litter. He had never seen a bigger cat than himself so when he popped out of his cage, his shock at seeing the much larger Delilah was immense! She was not sure what he was or what he was doing there and he was terrified yet somehow compelled by her so it was a little stressful for all of us for a couple of days. My friend told me that I coddled Samson too much and, at the time I thought he was ridiculous but now that Sammy's a full-grown cat and he still spends much of his time feeding on the buttons on my shirt, I think I might have to agree. Delilah's 'love' for him at first consisted of very heavy playing that always left him pinned down and squealing. I never reprimanded Deli because I knew she was just being a kitten (and we all know that kittens don't understand the word 'NO') but I couldn't resist scooping Samson up in my arms and snuggling him when Delilah got the best of him. Samson doesn't have all the hunting and dexterity skills of a cat that had mama cat training but Deli continues to try to teach him every day and he is really enthusiastic to try anything she offers. His lack of precision while jumping usually led to him hanging off of furniture by a claw, squealing and swinging like a pendulum while Delilah looked on wondering how he did that. This is when I started calling him Monkey and the two of them The Monkeys because all they did was goof around and climb everything in my apartment. Samson and Delilah's relationship has blossomed into a real loving friendship but he still comes to me when she rejects him (which is often). He is the sweetest, most loving little boy ever! Samson and I are taking a two day break but it's not what you might think! 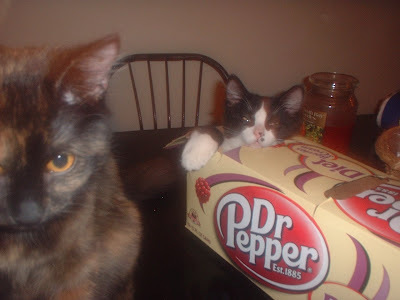 Mommy asked if she could write our Mancat Monday and Tortie Tuesday posts. Of course we were a little hesitant because she's Mommy and she gets a little out of hand sometimes when it comes to her Monkeys but, we decided that we could use the break so we're going to risk possible embarrassment and let her do her thing. Please friends, keep in mind that she may say some stuff that is just not true! She has a tendency to exaggerate but, don't all Mommies? Anyway, Samson and I are going to relax, lie in the sun, eat, beat up toy mousies and just enjoy this nice weather! If you have read our recent posts, you will know that know that Mommy's friend Jenn had adopted the very sweet little Pasha. They had all last weekend to bond and everything went very well...until Jenn had to go to work on Monday. As she closed the door to leave, she heard Pasha crying very loudly! Of course, it was heart-wrenching for Jenn and she spent all day worried. Luck would have it that the other kitten (her sister) was still available so Jenn brought the other one into the house. It was not a happy reunion! Pasha had already established herself as the cat in that house and claimed Jenn as her Mommy so her reaction to her sister was less than favorable! 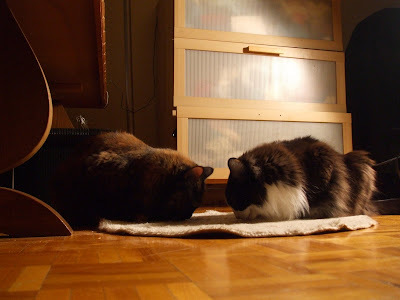 Thankfully, over the next couple of days, she bonded with her sister, Mischa and now they're inseperable (as you can see in the photos). Jenn, of course, is ecstatic as a new cat mommy so we're very happy all around! We're going to try to get pictures of Jenn with her little furry bundles of joy very soon.